This screen will be large enough to accomodate 250 people lounging, 450 people sitting and 750 standing. 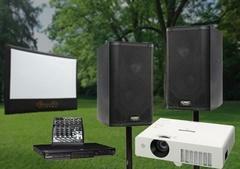 The 18 foot screen also comes with a DVD /Bluray player, Vivitek projector, 400 watt PA system, screen, and movie operator. If you prefer an even larger screen, please ask about our 22’ package! Both are sure to wow attendees. The rental is for a standard movie at 2.5 hours. Please e-mail us for additional time fees or request (party@hullabaloosbounce.com). Please note the screen is ran with a projector, and the set up area will need to be dim to dark for the best experience. Throw a movie party your friends will be talking about for months! 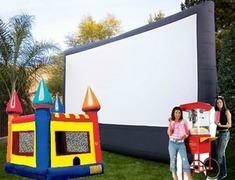 This package comes complete with an 18 foot inflatable movie screen, 400W sound and HD connections, Popcorn, and your choice of any regular Bounce House. This giant screen will accommodate 250 people lounging, 450 people sitting and 750 standing. The screen also comes with a Vivitek projector, PA system, and a whopping 220″ diagonal viewing area. *Please call our office to book this package.